Royal Doulton Bone China - Founded 1815 Fulham, London by John Doulton and John Watts. Believe it or not this company was originally not about to get into bone china production! When John Doulton began as a potter in the beginning years of the 18th century, bone china was only newly discovered, was a secret recipe and not yet a commercially available option. Salt-glazed stoneware was the thing the young John understood. Tired of working for others, potter John Doulton started his own business with John Watts in 1815 at the age of 22. The new business flourished subsequently relocating from Fulham to Lambeth, London. Originally, ceramics for the home were not the most profitable part of their product range. Successor to John, his son Henry Doulton changed all that. 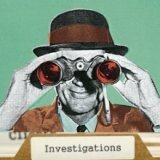 He was instrumental on pushing the decorative product development. Henry was responsible for many innovations including the first steam driven potter’s wheel. 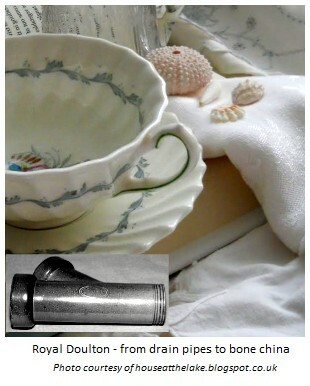 The early development of Royal Doulton bone china was bankrolled to a large extent by manufacture of sewage pipes. Never was the Northern English phrase: “Where there’s muck there’s brass” more apt! However, while other Staffordshire potters were having spectacular successes with the new 'bone china' material, Henry was reluctant. Only in 1884 was he persuaded to use the newly developed Royal Doulton bone china body and to spread the artistic imagination of the company further than their wonderful Lambeth Art Department stoneware. Soon they were surrounded by one of the most outstanding teams of modellers, decorators and painters in the world. The fame of the company and of its products became truly international - both his Lambeth Stoneware Art Pottery and his Royal Doulton bone china. Henry was knighted by Queen Victoria in 1887. That notoriety was extended into the 20th century under a new art director, Charles C. Noke (a particular hero of mine who inspired me to want to sculpt Royal Doulton bone china figurines). And through the talents of a brilliant generation of artists who had developed during the latter part of Queen Victoria's reign (Joseph Hancock, Harry Tittensor, Edward Birks, Percy Curnock and others). In 1901, Edward VII granted a Royal Warrant and the company began producing Royal Doulton bone china collectibles including figurines and jugs. 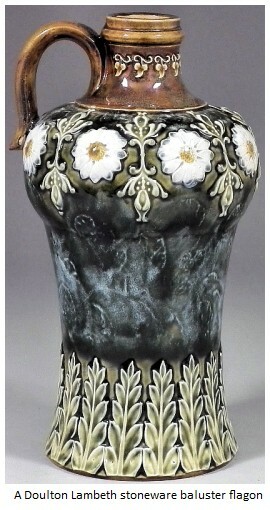 Doulton was always leading the way in creating new glazes and decorative effects. 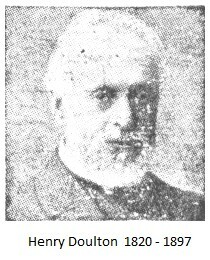 Sir Henry Doulton died in November 1897 and was succeeded by his son (another Henry) Henry Lewis Doulton (grandson of founder John) who was in control until 1925. Royal Doulton Bone China was granted a Royal Warrant and right to use ‘Royal’ in the name of its products by King Edward VII in 1901, something that Henry senior missed by only 4 years. 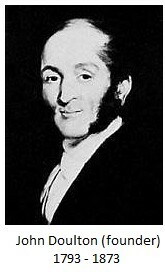 John Doulton was born in 1793 and was an ordinary working boy, apprenticed into the pottery trade in London. Most top ceramic entrepreneurs I write about are Staffordshire people (Staffies), so to write about a Londoner is a new experience. To be apprenticed in the pottery trade at that time was not a bad move at all. It was to acquire a skill in a busy and burgeoning industry. His mother must have been proud (she would have loved the Royal Doulton bone china, had she lived to see it). Doulton obviously had some gumption as he worked very hard, saved lots of money and had a grand plan in the back of his mind. 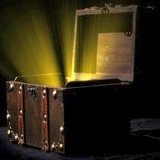 Yes, and he also possessed that truly useful of all attributes BLIND AMBITION! Combined with good health, high energy and native intelligence it can go a long way. By the age of 22 John D. had carefully managed to save the grand total of £100 pounds to his name. No gambling, drinking or facebooking for him then! I wanted to know exactly what value that £100 would have today, but it's hard to get an accurate conversion as food was a lot more expensive, but property relatively less. 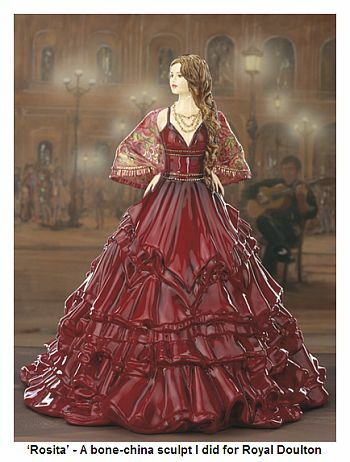 However, I came up with the figure of about £8500 pounds (about $14,000 dollars). Not sure how accurate this is, but it makes sense that a frugal and determined young person could scrape together that amount to start a business. John learned his trade at the Fulham Manufacturing Co. founded in 1688. He would have joined in the early 1800's. Fulham were English pioneers of salt-glazed stoneware and already had over a century of experience which the young Doulton must have lapped up. Later this Fulham factory was to be bought by him and his partners and re-named Jones, Watts & Doulton (the young apprentice lad liked it so much he bought the company!). This works was to specialise in Doulton's decorative stoneware - made to amuse the middle classes with disposable income. Meantime, the year is 1815 the budding entrepreneur took his £100 wedge and put it into the pottery of a Martha Jones of Lambeth (about 4 miles away from Fulham on the south bank of the River Thames). Her main man was a chap called John Watts. He was one of those indispensable type people you sometimes need to have around, and so Doulton agreed to owning the company in a three way split. It was re-named Jones, Watts & Doulton. By 1820, Martha opted out, so Doulton & Watts it became. In 1926, new premises were aquired in Lambeth High Street. The core products were useful, practical items as well as salt-glazed decorative wares. No Royal Doulton bone china in those days. Son Henry was a chip off the old block - and some. He was the brightest of John's children. Lucky for them Henry was born a Doulton. In 1835 Henry was apprenticed into the firm. He rightly had to learn everything from the ground up. Henry's success was soon to eclipse even his switched-on dad. 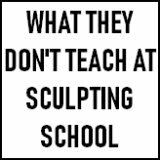 He began from an artists perspective, dabbling and experimenting with enamel glazes, fully engrossed in learning the art of the business. By 1846 he was attempting to save nation from cholera and typhoid with his sanitary products. A far cry from the later luxury Royal Doulton Bone China products. By the 1860's he was the Member of Parliament for Lambeth. By the 1870's he was heading an innovative Art Department creating beautiful contemporary art pottery and developing a new Staffordshire luxury china manufacturing unit. By 1887 he was knighted, and in 1901 the results of his labour was rewarded by the King with a Royal Warrant (which, sadly he missed by four years as he died in 1997). Henry Doulton's first big idea was to try to help with death and disease of his fellow Londoners. At the time people were only just beginning to understand the role of dirt and germs in awful killer diseases. Once evidence came to light of the link between poor levels of sanitation and disease, Henry Doulton, the son was quick to jump at innovating products to help clean up the streets. At this time (1846 - 1853) Doulton & Watt became a leading UK company. But at the same time, it was up to son Henry to see to that the truly artistic, luxurious and glamorous side of the Doulton business was bought to the fore. It seemed the 1853 retirement of John Watts marked the beginning of this process and the following year, the Company became Doulton and Co, which it remained until 1972. It is at this point you have to really think of the Doulton wares as almost two separate companies as the two branches developed separately in different locations . The Lambeth branch continuing with decorative stoneware, the Staffordshire plant concentrating on fine china, Royal Doulton bone china and porcelains. Remember though that Lambeth production only closed in 1956 and the Doulton head offices remained there until 1971. 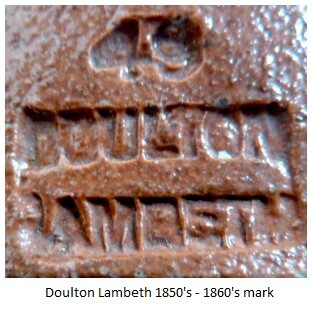 In the early 1860's - the Lambeth had been making 'Doulton Ware' - the famous decorative stoneware. At the same time, Henry joined the management team of the Lambeth School of Art and from this clever association was born the Art Department (1871). From 1862 - 1868 he was Member of Parliament for Lambeth, so he was an influential person. The ensuing Art pottery used students from School to great effect. Note-worthies were Edwin Martin and his brothers Walter and Charles - known for their range of grotesque Wally Birds. Hannah Barlow and her sister Florence were notable artists and George Tinworth a very competent sculptor. Dad John died in 1873, a time when the famous Art Department of Doulton & Co Lambeth was beginning to blossom. 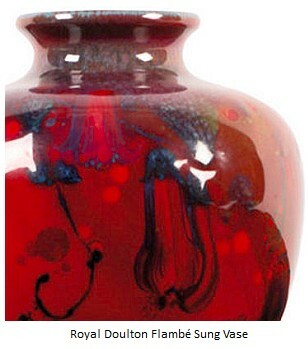 Doulton & Co's association with the Art School became internationally successful winning awards at Exhibitions as prestigious as the Philadelphia and Chicago Exhibitions in the USA. By the late 1890's nearly 400 artists were working in Lambeth. Lambeth stoneware is and always has been collectable. Perhaps even more so that the Royal Doulton bone china production. In the 1970's, Doulton took advantage of the name and made 'Lambeth Stoneware' into a tableware collection in it's own right. Queen Victoria died in 1901 and that was it, almost immediately for Victorian era sensibilities. Tastes were changing and demand was declining for Lambeth's stoneware. Ironically, this is the same year that the new king bestowed his royal warrant on the company - presumably for what they were doing in Stoke. Lambeth tried to keep up with changing fashion, but by the 1920's working artists at Lambeth had declined in number by 90%. A small output was maintained up to and including the second world war. Post war an attempt was made to keep Lambeth going when art potter Agnete Hoy was brought on board to try to ralley the pottery. Ultimately it was an unsuccessful attempt and the works finally closed in 1956. 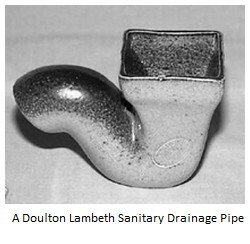 Lambeth however, continued as the HQ of Doulton & Co until 1971, despite their huge presence in Staffordshire. Henry Doulton, a Londoner through and through, realised his company should have a manufacturing presence in the heart of the pottery making area of Britain - Staffordshire. So in 1877 he negotiated with Burslem company Pinder, Bourne & Co to take a controlling interest. 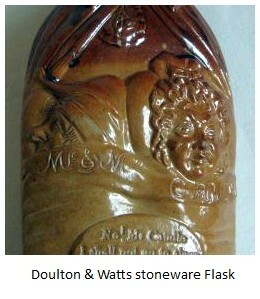 The newly Doulton owned works were located at Nile Street, Burslem, Stoke-on-Trent, Staffordshire and continued right through until 2004. It was a place I visited many times as a free-lance modeller/sculptor for Royal Doulton Bone China figurines. To get from the car park to the revered Royal Doulton bone china figurine department was quite a historic experience in itself, going through a warren of various back lots, overgrown grassy areas and creaking wooden doorways until you finally found the stairwell which led up to the very well Kept art offices. 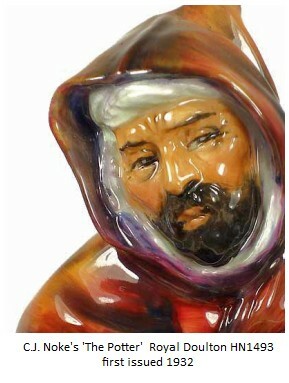 Getting back to 1877, Henry Doulton at this point came into his own. He immediately recognised the talent of two key Pinder employees and pounced on them quick. Now, under the stewardship of two such able individuals Doulton Staffordshire was ready to rock - and challenge even the achievements of Lambeth at its height. Royal Doulton bone china ranges were first developed in 1884. Bailey and Slater looked to at least match the porcelain quality of Derby, Minton and Worcester. The boss H. was more dubious. After all, bone china production was a money sink - expensive to produce and easy to to bust trying to make. The boys had their way and things went well. Henry Doulton was knighted in 1887 and in 1889 one Charles Noke joined the firm (another good day for the company). Noke dreamed up the concept of 'Series Ware' different scenes employed on a variety of shapes. By 1904 Noke had developed ‘Flambe’ ware with colleague Bernard Moore. In 1913 the HN series was released with HN1 ‘Darling’ being the first product. Charles J. Noke's secret was that he was trained at Worcester under Charles Binns, and was, well, a genius as an artist, a modeller, a ceramic chemist and an ideas man. In 1914 he succeeded John Slater as Art Director. By the 1930's the initial blast of interest in Doulton's Nile Street decorative wares was declining, so they needed new ideas quick. So, in 1934, the range of Toby Jugs were launched. Other product development ideas were notched up one by one - commemoratives, animal models, fine porcelain tableware, children’s china, Bunnykins and Brambly Hedge. English Translucent China, also known as Doulton Fine China was launched in 1960. It was a new white transluscent clay body akin to bone china, but without the expansive bone ash ingedient. The European makers had never traditionally used bone ash, so you can see the logic. 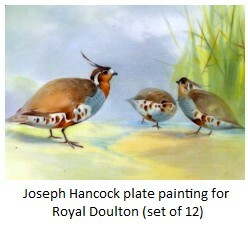 Doulton got to own many other famous name china companies including Royal Albert, Minton and John Beswick. In recent times Royal Doulton themselves have been acquired by the Wedgwood Group, and much of their ware made in Indonesia. In 2004, the remaining shadow Staffordshire workforce was moved to the Wedgwood Barleston factory. I remember it well. Only certain of the people I worked with made the move and subsequently all the ones I know either got made redundant or retired. A skeleton staff remain for the coach visitors and to make a few prestige items.